The Tlingit people, whose name means "People of the Tides", have a vast history; many speculate its origins dating as early as 11,000 years ago. Two major theories exist as to where the Tlingit people originate from, the largest being a coastal migration across the Bering Strait land mass from north Asia. Others, however, believe that the Tlingit people may have migrated from Polynesia by island-hopping. However, it is not disputed that the Tlingit settled along Southeast Alaska thousands of years ago. For these many years, they lived a hunter-gatherer lifestyle, subsisting off of the abundant Alaskan wildlife in a fashion few still continue today. 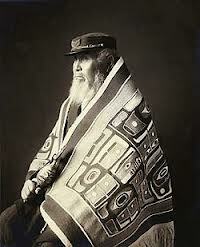 The Tlingit people shared relations with the neighboring Haida and Tsimshian tribes, as they do in the modern era. These peoples traversed the area with large canoes of red cedar, often averaging sixty feet in length. Trading their prized Chiklat robes, shells, and jewelry, they received well-crafted canoes and sturdy cedar trees from the Haida lands. However, times were not completely peaceful; the tribes fought and raided each other’s villages for riches and slaves. This trade continued upon the first arrival of Russian explorers in 1741. Although Aleksey Chirikov sent several men to the area who never returned, the fleet settled on the land peacefully several years later. Soon, in their wishes for conquest, the Russian men aggressively took advantage of the land and rerouted trade routes. In 1802, Chief Katlia of Sitka successfully forced the post to defect. The Russians, however, soon reclaimed the land, much to the resistance of local Tlingit. As the Americans attempted to purge their newly-purchased land in the mid 1800s, one half of the Tlingit population was eradicated by diseases such as smallpox. Mines and logging establishments were installed on their land, and many felt powerless under such dominating capitalistic forces. In 1912, hope was given to the Tlingit peoples as the Alaska Native Brotherhood was founded. This program was established with the goal of promoting equality for Alaskan natives. Their efforts led to the passing of a bill in which natives could become territorial citizens, albeit if they shed some of their “uncivilized” ways. However, their political power grew in 1924, when in the first year of eligibility for national citizenship, a Tlingit man became a member of the Territorial House of Representatives. This event hallmarked a longstanding history of Tlingit presence in politics. With the passage of the Alaska Native Claims Settlement Act (ANSCA), the Tlingit people were eligible for reclamation of their former land. The Sealaska Corporation sought and purchased the property, however, although the Tlingit still had the opportunity of a lawsuit. To this day, Tlingit natives are still receiving financial compensation for their lost land. As Americans and Christian missionaries forced their culture upon the Tlingit people, many attempted to fight inequality and prejudice. In 1945, Tlingit member Elizabeth Peratrovitch pled for the passage of an anti-discrimination bill, which eventually was made into law. The State of Alaska then recognized February eighth as an annual celebration day in her honor. Nowadays, ANSCA corporations have substantial lobbying power in the area, representing 16,000 Tlingit and Haida people. A large population have jobs in the logging, forestry, fishing, and tourism industries, while their support of higher education has led to many with occupations such as healthcare workers, lawyers, and educators. Most of these people have relocated to more populous areas of southeast Alaska for more abundant employment opportunities. Sealaska and other ANSCA corporations provide corporate and managerial positions to some Tlingit people. In 1978, tribal courts were introduced in the Sitka area to resolve civil disputes between various peoples and clans. Most Tlingit people tend to vote for the Democratic party, and most assume political office under that group as well. Significant amounts of people have also served in wars, with substantial support from the community. While many Tlingit have adapted to a modernized lifestyle, some are still attempting to subsist off of the Alaskan land, despite growing fishing and logging industries nearby. Unfortunately, this had made many of these people reliant on welfare as a partial contribution to income. This has also introduced several health issues to the area, with native Tlingit having high susceptibility to influenza, arthritis, hepatitis, cancer, and diabetes. Alcoholism, however, is the most prevalent disease among Tlingit natives. However, suicide rates are consistently lower compared to other tribes nationally, and members of the community are initiating support and rehabilitation groups for those afflicted with major health issues. The hopes to retain the Tlingit culture are evidently shared throughout the community.